Your first RingWord is FREE, for business or personal use. You can keep it as long as you like, or resell it to someone through the Offer Center. You must renew your word within the last month of it's expiration. You will be notified when the time comes. This is done to insure that the words are still active and in use. Other people may want to use an inactive word and this is a way to insure RingWords are not dormant or abandoned. You must make sure your contact information remains up to date or you will lose your RingWord. If we try to contact you and cannot reach you via email or phone, we will assume you no longer wish to keep your RingWord and it will be put back into the available pool of RingWords. To get your FREE RingWord, FIRST Register. It's free and we won't spam you. After you register we will send you a confirmation email. Confirm your registration using the email we send you. Then, search for your word. Click the check out button. 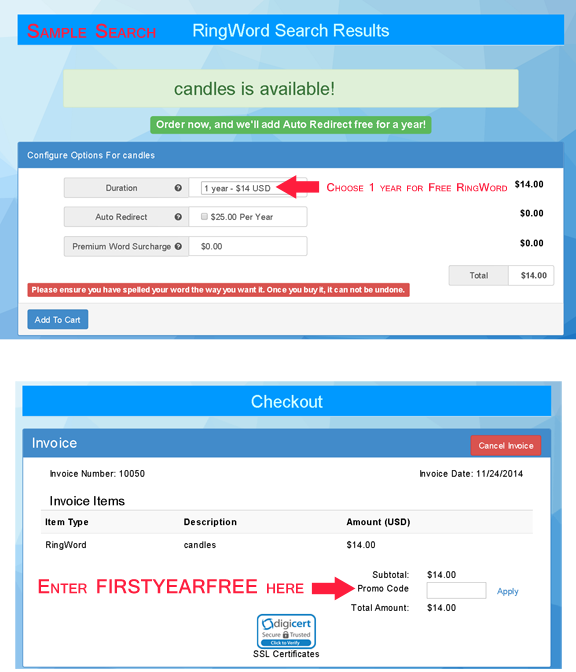 ENTER THE COUPON CODE: "FIRSTYEARFREE" (no quotes) in the Promo Code field in the checkout section. You will see that your $14.00 word now has a total cost of $0.00. * You MUST SELECT ONE YEAR from the dropdown to use your coupon. Additional year options are for paying customers only. * The word must be available and not owned by someone else. We "may" be adding advertising to Free RingWord profile pages. We "may" be offering you an opportunity to put advertising on your profile. Ads will be tastefully done, of course, and not interfere with your profile. This is done to subsidize the site and keep the lights on. If you do NOT want advertising on your profile page, simply pay the annual fee for your RingWord and ads will not appear. RingWord.com makes advertising easy and more profitable for companies by making their phone number unforgettable. Most companies will not want potentially competing advertising on their profile page and therefore will opt for the "no advertising option" by paying for their RingWord annually. Personal RingWord users may not care that advertising is displayed and will prefer the free option with advertising. MOST RingWords are $14.00 per year. Words owned by other RingWord.com members can be purchased but the price must be negotiated with the owner through the "Offer Center." Some words have already been purchased. You can always make an offer to the owner privately through the Offer Center accessible through your account. You will not be able to see the Offer Center unless you are a registered member of the site. There is no obligation to accept an offer and you can make a counter offer through the system as well. If a RingWord is sold through the Offer Center at a price > $14.00, the RingWord profile will not carry advertising for a year from the date of sale. When you purchase a word, it is yours for as long as you wish to use it, and as long as you keep your free or paid account up to date. You can renew your RingWord, or let it lapse. You can sell your RingWord to someone else through our Offer Center or RingWordAuction.com. If you wish to renew WITHOUT ADVERTISING DISPLAYED, the cost is $14.00 annually for all words. If you wish to renew WITH ADVERTISING DISPLAYED, it is FREE. Phone Number 408-357-4069 Pricing Questions?